The transliteration into modern Greek from the different ancient handwritings is done by H. R. Immerwahr and others, which in turn is transcribed by me, using this simple ABC table, at the same time backfilling the left out vowels, to reconstruct the inscriptions in today's spelling. Column krater from Caere by the Amphiaraos P. (see Amyx) (1873); lost in World War II. Formerly Berlin, Antiquarium F 1655. Date: c.560 (Schefold, LIMC i partly, ii, vii); LC (Lorber); c.570 (LIMC i partly, iii–vi (except iv, ‘Euphemos’, where 570–550 is given) ). In short, the Amphiaraos krater is a Late Corinthian red-ground column krater. It is considered the masterpiece of the Amphiaraos Painter (whose name vase it is) and one of the major specimens of the red-ground vase painting of Corinth. The Amphiaraos Krater depicts on the front a frieze of horsemen and above it the departure of Amphiaraos. The back was decorated with a battle frieze, above it again Amphiaraos, this time as a participant in the funeral games of Pelias. Below one of the handles, a wrestling match is depicted. The paintings on the vessel are considered especially colourful and detailed. Thus, the anger in Amphiaraos eye, looking at Eriphyle, his only family member not to wish for his safe return, is visible. A sorrowful seer indicates the imminent death of the hero. 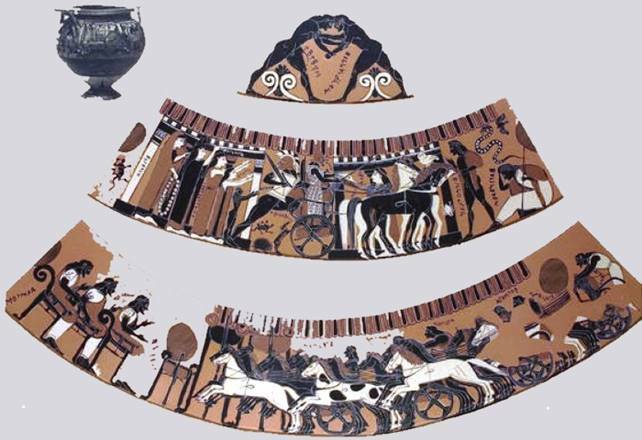 The same scene was depicted on the Kypselos chest in Olympia, as described by Pausanias.The krater used to be on display in the Antikensammlung Berlin, but disappeared at the end of the Second World War. 5 2. ... 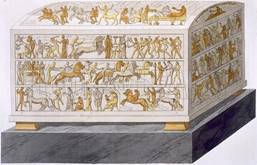 There is a chest made of cedar- wood, and on it are wrought figures, some of ivory, some of gold, and some of the cedar-wood itself. In this chest Cypselus, who became tyrant of Corinth, was hidden by his mother when at his birth the Bacchids made diligent search for him. As a thank offering for his escape his descendants, the Cypselids, dedicated the chest in Olympia. Chests were called kupselai by the Corinthians of that time, and it was from (6) this circumstance, they say, that the child got the name of Cypselus. 3. Most of the figures on the chest have inscriptions attached to them in the ancient letters: some of the inscriptions run straight on, but others are in the form which the Greeks call boustrophedon. It is this: the second line turns round from the end of the first as in the double race-course. Moreover, the inscriptions on the chest are written in winding lines which it is hard to make out. Beginning our survey at the bottom we see in the first space of the chest the following scenes. alone has her name written beside her. Iolaus, who voluntarily shared in the labours of Hercules, is represented victorious in the four-horse chariot-race. Here the funeral games of Pelias stop. name is not written beside him. Phineus, the Thracian, is represented, and the sons of Boreas are chasing the harpies from him. In the first part the daughter is accomplice/accessory to the death of her father, Pelops' father-in-low. In the followings the wife does the same, and for Amphiaraus' son it is proper/due to avenge his father's death and the rest of the story just elaborates on this saga. A picture is worth a thousand words, but this one, from the book titled General study of Greek architecture and sculpture, Paris, 1814, is only to help one's imagination. Unfortunately we don't have a picture or a drawing of the chest, only Pausanias' description of it, but luckily for us, he did write down the annotations to the picture. The semantic meaning of images depends on the objects, their characteristics and their relations to each other. The “names” attached to the picture on the chest helps immensely to comprehend its message, because they are talking names. Pausanias' description of the scene and naming of the actors makes only sense, when one knows the works of Homer, Apollodoros, Diodorus Siculus, Hyginus, Plutarch, etc. Even then the names are not much more than the “John-was-here”-like environmental vandalism, but by reading the names' original Scythic/Hun/Hungarian meanings the picture gets a new dimension. This reading of the annotations tells a story on its own, it even has some moral to it. But this higher level semantic information contained in the annotations remained hidden so far, although it was there for everyone to take, written in a well known alphabet, with known method of writing: the so called defective notation of vowels, and in a live language. Some reasonably sounding questions about the objective and impartial science would be due here, but they wouldn’t be PC, so let us move on. Pausanias' description tells us what and who (of whom) is on the picture, while the above reading talks about the meaning of the picture by complementing it with essential additional information and by summarising its content. Even though this text is much more than the labelling, it is still only complementing the semantics of the picture and the verbal and/or written saga told by the minstrels and poets, jet it is complete and in ode-like style tells the story quite accurately. The story on the vase is that of Kypselus as it is tallied in Pausanias' book 5. 17. 5.: from the innocent baby to the tyrant of Corinth, who attacks his on kind. As you can see the (hi)story Pausanias and others talk about at length has been told on the vase in the “names” of the depicted persons, and concentrating only on the meat, the main points. Of course, one has to be familiar with the story and the language, and reads it complementary to the depicted scene. On the other side, most of the names – read by the researchers – have not the slightest relevance to the story. This is actually the main difference one finds when reading Hungarian tales: the players are rarely named, while in the Greek myths even the least significant actor's grand-mother and her dog is named. In R. Wachter's opinion the names of Aμφιαραος' wife Εριφυλε, daughter Ευρυδικε, his charioteer Βατον are O.K., as they are attested elsewhere too. The nurse's name Αινιππα occurs only on this vase. For Αλκ he argues that it must be Aλκμαιων, the son of A(μ)φιαραος, who’s name appears twice: (f) & (r), in two different forms on the same vase! Nothing to worry, there is scientific explanation for everything and its opposite as well. Βατον is a hypocoristic (nickname) of Ευρυβατος, Ηιπποτιον is centaur or horse name, etc. There is not much concern about the discrepancies between the names of Pausanias' actors and the names of actors depicted on our vase. The question falls into the hard basket of science, so better avoid it. But what else to do? We could use (and we did) our common sense: there was a chest with a painted story about Cypselus complemented by description (in bubble words spoken by the depicted persons and/or by the painter) written in Scythian/Hun/Hungarian, the language of the unnamed but documented substratum of pre-Hellenic Greece (about this see R. S. P. Beekes and others). Pausanias had heard the story of Cypselus retold to him in Hellenised Greek and he had believed that he read on the chest the “names” of the – in the original story mostly unnamed – actors, in fact he was reading, without his knowledge, the original story in Scythian and/or ancient Greek, written in the adopted and adapted Greek alphabet, and out of ignorance or deliberate disguise, he impersonated the – for him unintelligible or concealable – elements of the story. As the story on our vase has been worded a bit differently and concentrating more on the story of Cypselos compared to Pausanias' version, the “names” of the actors differ accordingly. Some of the “names” or labels in Wachter's vocabulary, could also be the real names of the main actors, although slightly misspelled sometimes if the wording of the text demanded it. It is worth noting here that in the spoken Scythian/Hun/Hungarian language the “name”/”word” is actually the szólam ('stock phrase'/'slogan'/'musical part'), which can contain more than one word (szó) and is pronounced in one go, always with ascending intonation, giving the language its characteristic musical sweetness. Hydria from Vulci, by the Inscription P. (Jan. 1829). Munich, Staatliche Antikensammlung SH 596. Scene: In front of a group of three men and a woman, all unnamed, Atalante (a) (the name begins at the back of her head running to l.) is wrestling with a naked man facing her (b) (the name begins at the back of his head running to r.), behind whom three men, one dressed and holding a spear (c) (the name is painted on his robe), one naked (d) (the name begins next to his forehead), and another one dressed (unnamed), are watching the match. In the background a boar’s head is lying on a table. On the reverse of the vase Zeus (e) is fighting a winged, bearded, long-eared creature with double snake body (Typhon, unnamed). Date: 540/530 (Arias–Hirmer–Shefton, Simon–Hirmer); c.550 (Schefold (1964) and (1966), LIMC vii); c.540 (Schefold (1978); LIMC ii–vi); c.530 (Schefold (1993) ). Wachter's interpretation: Before the wrestling match of Atalante and Peleus at the funeral games for Pelias (labels). Zeus fighting Typhon (label). A kaszt a jogok vagy előjogok öröklődésén alapuló, rendkívül zárt társadalmi csoport, mint például az arisztokrácia vagy azon belül is egy dinasztia. 1 a Caste is an exclusive social class, such as the aristocracy including a dynasty. lásd GeSZTes v. KaSZTa-Dió: “Igen fás és nehéz feltöretû dió” CzF, KáSTYé: “kincstár, kincstartó szoba a göcseji pórnépnél” CzF, KaSTély: “erõdített urasági lak” CzF, CSőSZ, és az angol CHeST, mind őrző-védő zárt láda/épület. Dr. ACZÉL József, have had shown that ancient Greek and Scythian/Hun/Hungarian have around 3000 concordant root-words and most of the grammar is shared, but his work is simply ignored by the MTA (Hungarian Academy of Sciences), for the sake of political correctness. Οἰνόμαος διώκων Πέλοπά ἐστιν ἔχοντα Ἱπποδάμειαν: ἑκατέρῳ μὲν δὴ δύο αὐτῶν εἰσιν ἵπποι, τοῖς δὲ τοῦ Πέλοπόςἐστι πεφυκότα καὶ πτερά. ἑξῆς δὲ Ἀμφιαράου τε ἡ οἰκία πεποίηται καὶ Ἀμφίλοχον φέρει νήπιον πρεσβῦτις ἥτις δή:πρὸ δὲ τῆς οἰκίας Ἐριφύλη τὸν ὅρμον ἔχουσα ἕστηκε, παρὰ δὲ αὐτὴν αἱ θυγατέρες Εὐρυδίκη καὶ Δημώνασσα, καὶἈλκμαίων παῖς γυμνός. Ἄσιος δὲ ἐν τοῖς ἔπεσι καὶ Ἀλκμήνην ἐποίησε θυγατέρα Ἀμφιαράου καὶ Ἐριφύλης εἶναι. Βάτων δέ, ὃς ἡνιοχεῖ τῷἈμφιαράῳ, τάς τε ἡνίας τῶν ἵππων καὶ τῇ χειρὶ ἔχει τῇ ἑτέρᾳ λόγχην. Ἀμφιαράῳ δὲ ὁ μὲν τῶν ποδῶν ἐπιβέβηκενἤδη τοῦ ἅρματος, τὸ ξίφος δὲ ἔχει γυμνὸν καὶ ἐς τὴν Ἐριφύλην ἐστὶν ἐπεστραμμένος ἐξαγόμενός τε ὑπὸ τοῦ θυμοῦ,ὡς μόλις ἐκείνης ἂν ἀποσχέσθαι. μετὰ δὲ τοῦ Ἀμφιαράου τὴν οἰκίαν ἔστιν ἀγὼν ὁ ἐπὶ Πελίᾳ καὶ οἱ θεώμενοι τοὺς ἀγωνιστάς. πεποίηται δὲἩρακλῆς ἐν θρόνῳ καθήμενος καὶ ὄπισθεν γυνὴ αὐτοῦ: ταύτης τῆς γυναικὸς ἐπίγραμμα μὲν ἄπεστιν ἥτις ἐστί,Φρυγίοις δὲ αὐλεῖ καὶ οὐχ Ἑλληνικοῖς αὐλοῖς. ἡνιοχοῦντες δὲ συνωρίδα Πῖσός ἐστιν ὁ Περιήρους καὶ ἈστερίωνΚομήτου, πλεῦσαι καὶ οὗτος λεγόμενος ἐπὶ τῆς Ἀργοῦς, καὶ Πολυδεύκης τε καὶ Ἄδμητος, ἐπὶ δὲ αὐτοῖς Εὔφημος,Ποσειδῶνός τε ὢν κατὰ τὸν τῶν ποιητῶν λόγον καὶ Ἰάσονι ἐς Κόλχους τοῦ πλοῦ μετεσχηκώς: οὗτος δὲ καὶ τῇσυνωρίδι ὁ νικῶνἐστιν. οἱ δὲ ἀποτετολμηκότες πυκτεύειν Ἄδμητος καὶ Μόψος ἐστὶν ὁ Ἄμπυκος: ἐν μέσῳ δὲ αὐτῶν ἀνὴρ ἑστηκὼςἐπαυλεῖ, καθότι καὶ ἐφ᾽ ἡμῶν ἐπὶ τῷ ἅλματι αὐλεῖν τῶν πεντάθλων νομίζουσιν. Ἰάσονι δὲ καὶ Πηλεῖ τὸ ἔργον τῆςπάλης ἐξ ἴσου καθέστηκε. πεποίηται δὲ καὶ Εὐρυβώτας ἀφιεὶς δίσκον, ὅστις δὴ οὗτός ἐστιν ἐπὶ δίσκῳ φήμην ἔχων. οἱδ᾽ ἐς ἅμιλλαν δρόμου καθεστηκότες Μελανίων ἐστὶ καὶ Νεοθεὺς καὶ Φαλαρεύς, τέταρτος δὲ Ἀργεῖος καὶ Ἴφικλοςπέμπτος: τούτῳ δὲ νικῶντι ὀρέγει τὸν στέφανον ὁ Ἄκαστος: εἴη δ᾽ ἂν ὁ Πρωτεσιλάου πατὴρ τοῦ στρατεύσαντος ἐςἼλιον. κεῖνται δὲ καὶ τρίποδες, ἆθλα δὴ τοῖς νικῶσι, καὶ θυγατέρες εἰσὶν αἱ Πελίου: τὸ δὲ ὄνομα ἐπὶ τῇ Ἀλκήστιδιγέγραπται μόνῃ. Ἰόλαος δέ, ὃς ἐθελοντὴς μετεῖχεν Ἡρακλεῖ τῶν ἔργων, ἔστιν ἵππων ἅρματι ἀνῃρημένος νίκην. τὸ δὲἀπὸ τούτου ἀγὼν μὲν ὁ ἐπὶ Πελίᾳ πέπαυται, τὴν ὕδραν δέ, τὸ ἐν τῷ ποταμῷ τῇ Ἀμυμώνῃ θηρίον, Ἡρακλεῖ τοξεύοντιἈθηνᾶ παρέστηκεν: ἅτε δὲ τοῦ Ἡρακλέους ὄντος οὐκ ἀγνώστου τοῦ τε ἄθλου χάριν καὶ ἐπὶ τῷ σχήματι, τὸ ὄνομαοὐκ ἔστιν ἐπ᾽ αὐτῷ γεγραμμένον. Φινεύς τε ὁ Θρᾷξ ἐστι, καὶ οἱ παῖδες οἱ Βορέου τὰς Ἁρπυίας ἀπ᾽ αὐτοῦ διώκουσιν. You can comment on an article without registering by choosing a nick. Don't forget: the words you label others tells more about you than about the subject of your smearing. Write into the box below the codes from above. It serves to prevent abuse by automated programs. (If you're not sure about the presented codes, you can ask for another set by clicking on the arrows. The Scythian language resurrects as Scythic-Hun-Magyar. This work is based on Rudolf Wächter's book, entitled Non-Attic Greek Vase Inscriptions. He sets out the goal to identify “the linguistic and epigraphical features” of the inscriptions, but makes himself lame at the outset for the linguistic aim by declaring that al the inscriptions are only names (labels): heroic, non-heroic, or even good for nothing “throwaway” names. On the contrary, we read these “names” and conceive them as explanatory and complementary words to the drawn scene. What the ancient painters could not express with their pictorial means, they have added in words without any prudery. As a matter of facts, without reading and understanding these inscriptions one cannot really comprehend what the drawing is all about. The vases in Wachter's book are categorised epigraphically, by the locally used variant of the alphabet, into 22 groups named after these localities. We will follow this line, only breaking the text up into more easily manageable pieces. Due to the limitations of our browsers, we use only the transliterations of vase inscriptions to modern Greek alphabet, which in turn we transliterate, using the table in the Alphabets blog, into Magyar ABC and read the inscriptions by backfilling the left out vowels. Making Sense after Rudolf Wachter II. Making Sense after Rudolf Wachter III. Making Sense after Rudolf Wachter IV. Making Sense after Rudolf Wachter V.
Making Sense after Rudolf Wachter VI. Making Sense after Rudolf Wachter VII. 3 guests are reading us. The number of visitors to the site so far is 186267 . There are 6 registered users. The visitors did post 2 comments to the topics of 1 forums.